We start 2018 with the next in the series of Illustrated talks on 11th January in the Millar Hall at 7.30pm. 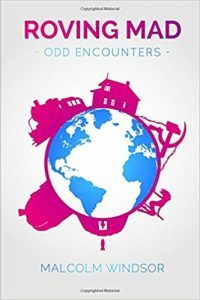 Malcolm Windsor has recently produced a book – “Roving Mad: Odd Encounters“- about some of his adventures in a long career of travelling the world. He is also offering copies of his book at the special price of £7 – of which £2 will be donated to Dr Neil’s Garden. No need to book in advance, just come along on the night.